In this same case, persist() will never give any value back to the client, hope you are clear. When to use Persist() and when to use save() ? persist() is well defined. It makes a transient instance persistent. However, it doesn’t guarantee that the identifier value will be assigned to the persistent instance immediately, the assignment might happen at flush time. The spec doesn’t say that, which is the problem I have with persist(). persist() also guarantees that it will not execute an INSERT statement if it is called outside of transaction boundaries. This is useful in long-running conversations with an extended Session/persistence context. A method like persist() is required. save() does not guarantee the same, it returns an identifier, and if an INSERT has to be executed to get the identifier (e.g. “identity” generator, not “sequence”), this INSERT happens immediately, no matter if you are inside or outside of a transaction. This is not good in a long-running conversation with an extended Session/persistence context. Pass an unchecked value from user input to the database will raise security concern, because it can easy get hack by SQL injection. You have to avoid the above bad code and using parameter binding instead. There are two ways to parameter binding : named parameters or positional. The setParameter is smart enough to discover the parameter data type for you. You can use setString to tell Hibernate this parameter date type is String. This feature is great ! You can pass an object into the parameter binding. Hibernate will automatic check the object’s properties and match with the colon parameter. This approach is not support the setProperties function. In addition, it’s vulnerable to easy breakage because every change of the position of the bind parameters requires a change to the parameter binding code. In Hibernate parameter binding, i would recommend always go for “Named parameters“, as it’s more easy to maintain, and the compiled SQL statement can be reuse (if only bind parameters change) to increase the performance. An object is in transient state when it is in heap but not persisted or yet not been given to the hibernate session for persistence. Once the object/entity is inatilized and exists in memory, however it is not handed over to hibernate, it is in transient state. When object is being handled or tracked by hibernate session or is in control of hibernate it is called as persistent state. Object in this state remains in synch with the database and is managed by the persistence manager. After the session is close or once hibernate session leaves the control of object it is called as detached state. covered later in class when cache is discussed. current state; to include changes made while detached. A detached instance can be reattached to a new Session at a later point in time, making it (and all the modifications) persistent again. This feature enables a programming model for long running units of work that require user think-time. We call them application transactions, i.e., a unit of work from the point of view of the user. Hence once the object is persisted, it transition is mainly in between two states detached and attached (persistent) in its life cycle. It can also come back to transient state only if call delete() in session. Now when we want to delegate the responsibility of maintaining the relationship on other side that time we can use mappedBy, In this way we might not require join table as well. 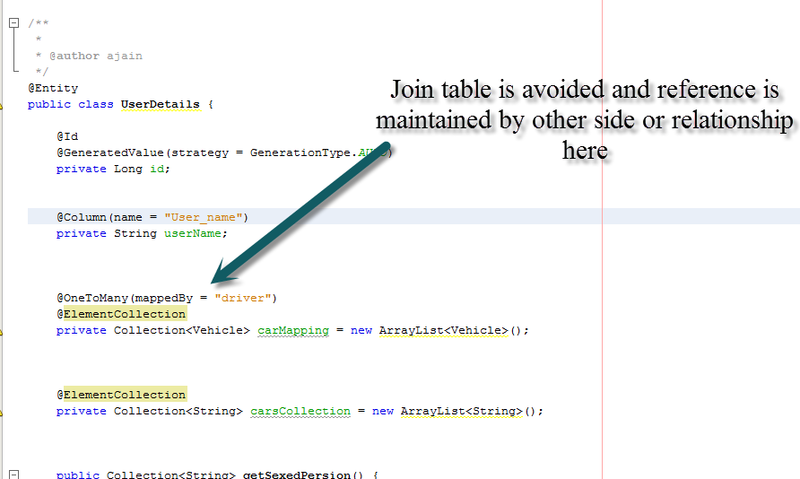 In this case a separate join table can also be avoided. This is for sure that to maintain one to many relation we need to have a collection reference in the source object class. Then what is the difference between the two ? @OneToMany(mappedBy = “driver”) here drive is the member variable from other entity. How to decide what kind should be used when ? I believe @ElementCollection is mainly for mapping non-entities (embeddable or basic) while @OneToMany is used to map entities. So which one to use depend on what you want to achieve. ElementCollection is a standard JPA annotation, which is now preferred over the proprietary Hibernate annotation CollectionOfElements. It means that the collection is not a collection of entities, but a collection of simple types (Strings, etc.) or a collection of embedded elements (class annotated with @Embedded). It also means that the elements are completely owned by the containing entities: they’re modified when he entity is modified, deleted when the entity is deleted, etc. They can’t have their own lifecycle.